Park at the Quail Springs Picnic Area/Trashcan Rock. The Hound Rocks are visible from the parking area, about half a mile southwest on the flats below the White Cliffs. There is an obvious trail starting at the parking lot, please use it. 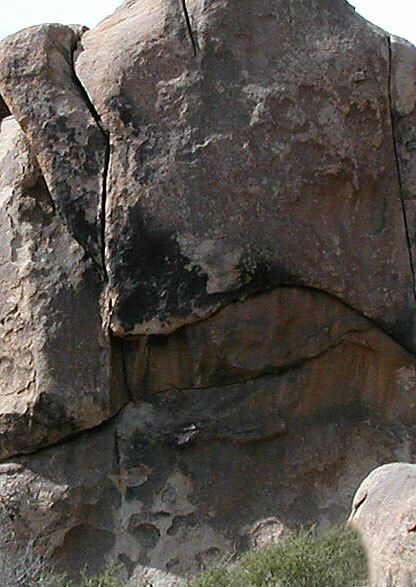 The first formation you come to is Baskerville Rock, and the Baskerville Cracks are facing you as you approach. a 1" cam, some 4"-4.5", 2"-3" for the anchor. This route sees minimal traffic, especially compared to the area classics - Right Baskerville and Tossed Green, two great 10a thin cracks. It gets no stars in the guidebook, but for my money it may be the best route on the crag. 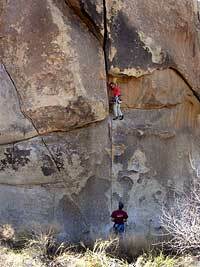 The crux is a 15' section of thin edging right off the ground with no pro. This is what gives it the "R", but it's all there and nothing insecure or awkward, so don't sweat it. Have a 1" cam ready for the first horizontal break. There are edges on both sides to help you get established in the wide. The wide is about 4"-5" before it dog legs and becomes wider, low angle, and trivial. I pushed a #4 camalot for most of the vertical wide section but it was tipped out at times. Maybe take a 4.5 too.